Honda has been very silent about Asimo, its super-advanced humanoid robot, in recent years. After introducing the first version in 2000, Honda showed several versions through 2005, until the company finally took the wraps off a new version earlier today in Tokyo. This model is the thinnest, fastest, and most “intelligent” Asimo yet. At 48kg, the Asimo that was shown today is 6kg lighter than the previous model. He now has 57 joints in his body (23 more) and walks at 9km/h (instead of 6km/h). Honda says that Asimos’s improved “intelligence” makes it possible for the robot to track a conversation between different people, recognizing the faces and voices of everyone involved (even when several people speak simultaneously). 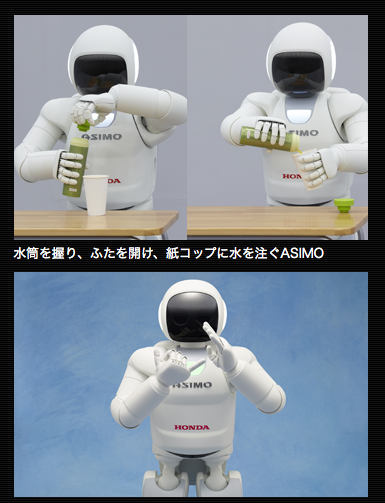 Another plus in the intelligence department: Asimo can now temporarily stop a certain action and resume it after performing a different task in between (for example opening a can of beer and pouring it into a glass – something, which wasn’t possible before either). If told, Asimo can kick a ball or start hopping now, too – on one or two legs. He can now even hop in a circular pattern.